ArtViews strives to support Montefiore’s mission to heal, to teach, to discover and to advance the health of the communities we serve. Exhibitions feature a wide range of artwork with diversity in theme, medium and execution that appeals to a wide audience while being respectful of cultural backgrounds and the Bronx community. Montefiore will sponsor six exhibitions yearly, with durations of between six to eight weeks. Themes are open to interpretation and individual artists, groups and curators living and/or working in the Bronx are eligible to submit proposals. All works in two dimensions, three dimensions, installation and video will be considered. Design exhibition announcement and "e-vite"
The Gallery is located on the 1st Floor of the Montefiore Medical Center Moses Campus. The space is accessible from the main hallway connecting to the East 210th Street lobby entrance. Please note that wall tiles are installed on the lower half of the walls, which limits the space for artwork. There is a maximum of five feet available for installation of artwork. 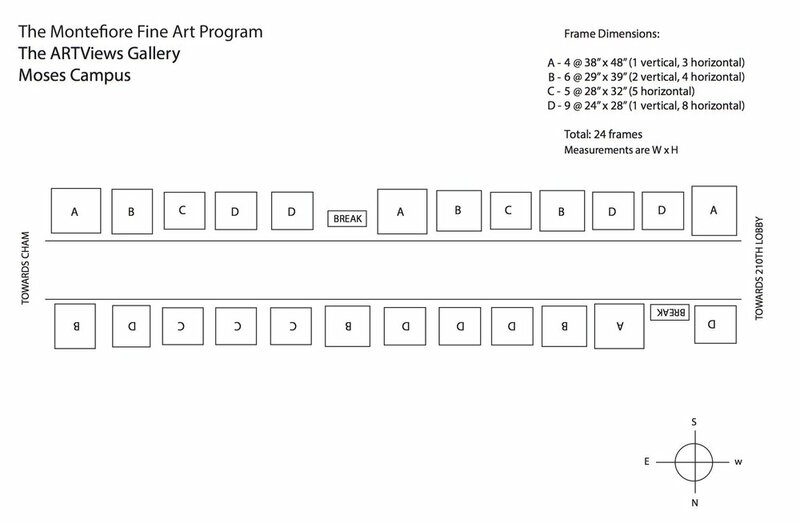 Overall measurements for the gallery are indicated below. Overall lighting for the space is ambient lighting. Please note the presence of a light fixture on the North Wall. The entrances to both the Departments of Diagnostic X-Ray and Radiation Oncology are located in this corridor. This a heavily trafficked corridor used by patients, staff and administration.